GET THE CROCHET WOLF APPLIQUE ALONG WITH THE GRANNY SQUARE PATTERN IN AN AD-FREE PDF DOWNLOAD HERE. 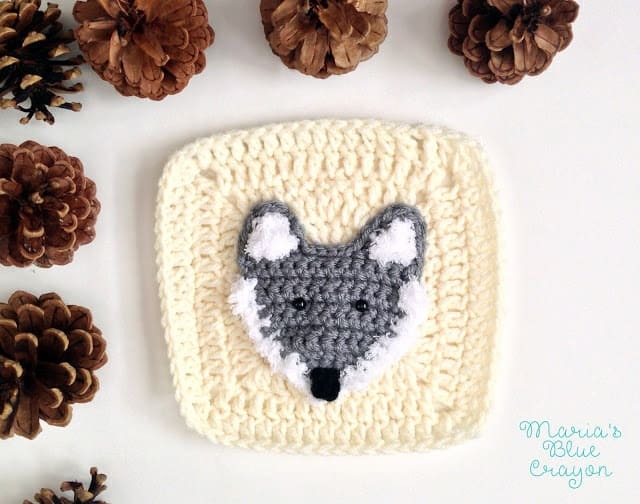 OR SCROLL DOWN FOR THE FREE WOLF CROCHET PATTERN. I’ve sat here and can not come up with words for this wolf. But just look at him. *squeal* I guess I don’t have words, just excited exclamations! When I think of wolves, I think of how luxurious their coats look. I wanted to capture that in this square, so I used a new yarn that I fell in love with! I used Bernat Pipsqueak yarn and it feels heavenly! This yarn is difficult to work with because you can’t really see the stitches since it’s so fluffy, but I made sure to keep it simple so everyone is able to join in on the fun! It’s been chilly here in Central PA, so I had a good excuse to stay in doors and get working on this afghan! We are expecting a snow storm in the next few days, and I’m crossing my fingers that it will allow me to get this whole blanket completed! I have joined all of my squares and am working on making multiples of the woodland themed animals to sew on. Do you like to join as you go? I am using the SC join method, if you were wondering. I think it’s looking fantastic! I will be posting more details of how I join this blanket so if this is your first time doing squares, don’t worry! There are many ways to join a granny square blanket, so by no means do you have to join the way I am. Use what works best for you! Also, YouTube is a great place to learn different techniques! For the granny square base pattern as well as a running list and links to animals already designed click here. *I definitely recommend the 100-piece safety eyes that you can purchase on Amazon. It’s the best price I can find. You can purchase at your craft store but you only get 10 pieces for about $3. You will need several for this Woodland Afghan project and are great for other projects such as amigurumi as well! I also recommend the clover hooks especially with the smaller crochet hook sizes. The whole set of 10 definitely saves you a bit of money if you are an avid crocheter – as you can see, just one hook costs about $9 (and around $10 in stores). *Purchasing from these affiliate links will help support my blog at no additional cost to you! Fasten off and leave tail for sewing onto square. To add the white fur around the face, attach white pipsqueak yarn between rows 10 and 11 on the left side of the head. SC down around the snout and back up to between Row 10 and 11 on the right side. Fasten off and leave tail for sewing onto square. Attach white pipsqueak yarn to the right corner of the last row of the head. SC in three spaces, turn your work, triple SC decrease, fasten off. Repeat for the left ear in the three stitches on the left side of the head. Using gray, SC around the right ear, slip stitch over to the left ear and SC around left ear. Chain 3, join to first chain. Fasten off. Sew onto face. Attach safety eyes to head. *Once you put on the safety eyes, you will not be able to take them out. Be sure they are spaced evenly before placing the backs of the safety eyes on to secure. Maria, I am absolutely in love with this blanket! Thank you, a million times over, for sharing your amazing talent for patterns! This is going to look so cute at my parent's little cabin! Do the safety eyes poke through and feel scratchy on the back? I've used safety eyes before for crocheted stuffed animals, but never for a blanket. Is there a special technique? I love, love, love this blanket!! My only suggestion… I'd die for a pinecone square!!! Do you turn after each row? Just having a bit of a time following the pattern. Is there something more obvious that I'm missing? Yes! I apologize I didn't specify in each row of the pattern. I only specified at the beginning that it's worked in rows and after each, you will be turning your work after each row 🙂 if you have any other questions- please let me know! Hi, Marie – When adding the white for the ears, your directions say to sc 3, turn your work, triple SC decrease, fasten off. I'm not understanding. Wonder if you could explain further. I appreciate your site so much!! Hi Diane! For the ear, attach the yarn where the pattern states then you will want to ch.1, single crochet into that same space and into the next 2 spaces, turn your work. ch .1, triple sc decrease. A triple sc decrease is as follows: insert hook into first stitch, pull up a loop, insert hook into 2nd stitch, pull up a loop, insert hook into 3rd stitch, pull up a loop, yarn over and pull through all loops on your hook. Love your applique afghans. although i not using them to make the afghans. i am making mug cozies. the applique are perfect. i wish i had the patients to make the blanket. Thank you for sharing your wonderful patterns.